Yargo is the one and only venture into science fiction by the renowned author of Valley of the Dolls, Jacqueline Susann. It was found amongst her estate sometime after her death by her husband who in turn published it on her behalf in 1979. I, like many adults these days who seek out and read this book, am someone who first read it as a teenager in the late 70’s and 80’s when the book reached the zenith of its readership. As is true with many fond memories from our youth, once re-experienced as an adult, often the re-visitation of the memorable event doesn’t live up to those recollections from childhood. I have experienced that with a few cartoons and movies of which I had the greatest of memories and so is the case with this book. Mrs. Susann was an intellectually gifted young lady and is reported to have scored near 140 on a standardized IQ test. It is perhaps this intelligent and inquisitive mind, driven by curiosity and the need for stimulation that led to a life of many “interesting” inter-personal relationships, marital strife, along with a very active role in the society pages and the limelight. Perhaps she was ahead of her time in taking on the writing of this novel in the late 1950s. The story is of a very young lady, Janet Cooper, who at the age of 21 is abducted by aliens by accident and ends up traveling to another solar system, to our own Venus and with the threat of being sent inevitably to Mars. In reading this story nearly seventy years later, the many technical mistakes and inaccuracies with their space travel, the alien environments, and life forms encountered are very noticeable. However, if one takes into account that this was written around the time of the first artificial satellite about Earth, before humans had even gone into orbit, before we went to the moon and only had fuzzy images of Venus from terrestrial telescopes, much of it is easily forgivable and should be treated as a snapshot of our understanding of the cosmos at the time of writing. And therein lies the difficulty of seeing into the future and writing science fiction; sometimes you just don’t get it right. Another characteristic of the book that can be forgiven due to the era in which it was written is the style of how the characters are portrayed. The dialogue and thoughts of the main character sound reminiscent of any female actress on the silver screen during the 1950s where most women were weak and had trouble formulating thoughts or defining who they were without the aid of a man. Had this book been written in this style and published today, I would suspect that most women would be insulted at the dependent, many times emotionally weak woman as the lead character. But again, when you take into consideration the time of writing you can smile at how quaint life must have been in that simpler era, move past this and enjoy the story. 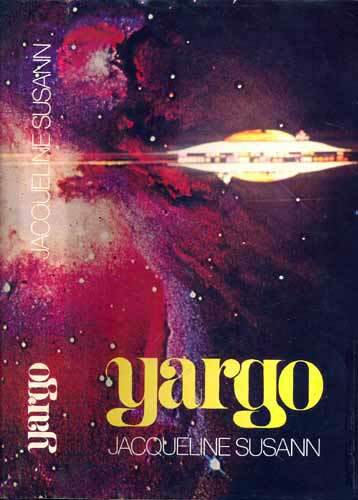 The original title of the book was Yargo: A Love Story, but it was later shortened to just plain Yargo. I suspect, and could argue the fact, that this is because only the last ten percent of the book had anything that could remotely resemble a love story. The remainder of the book on the surface has more to do with taking a raw look at what it is to be the emotional creature we call human. While it is unclear really what subplots and subtexts Susann intended, now in the early part of the 21st century, one could read that the majority of this book is more of a coming of age for the heroine. But upon closer inspection, it can be said that it is more of a veiled venture to explore what it is to be a strong woman in the 50’s (think Agatha Christie, Queen Elizabeth II, etc.) where a woman must be like a man, unfeeling and aggressive, to be taken seriously and what Susann feels women inevitably lose in the process. Yargo is a fine piece of work if it is taken in the context that it directly reflects society at the time it was written, which has its own merit as a time capsule of sorts. However, by today’s standards for acclaimed science fiction, it would be considered a fine rough draft; fine in concept and overall plot. It would intrigue me to be able to take this story, modernize the characters, fix the technical aspects and re-release it to possibly have a new generation fall in love with it all over again.